Do you have a bunch of unused metal laying around your Chicago home? Are a great deal of these metal items made out of iron, in particular? If so, and if you’re looking to get rid of them, you should consider recycling. Iron is recycled on a regular basis, helping the environment, and serving to keep down the cost of goods. Wondering which iron items can be recycled? Here is a list of some of the more common items. Kitchen pots can be made out of a number of different materials. However, they are most commonly made from either stainless steel or iron. Do you have iron pots which you no longer use? If so, you should think about recycling them. Iron pots can be shredded, melted, and transformed into other products, helping to keep prices down and benefit the environment. Just as there are iron pots, there are also iron pans. Like iron pots, iron pans are capable of being recycled. If you have any useless iron pans laying around the house, you would be wise to trade them in for a bit of money. Again, iron pans can be shredded and melted down, and then used to make new iron products of all kinds. Another common item which is made out of iron, and which can be recycled is cutlery. Knives, spoons, and forks of all kinds can be traded in to metal recycling companies for a chunk of money. It’s rare that homes utilize all of their spoons, forks, and knives. Therefore, you’re almost sure to have some spare cutlery sitting around your house somewhere. Clear some space and reap the benefits of recycling. Maybe you just recently got done installing a fence? Perhaps you have not yet disposed of your old fencing material? Maybe this old fencing material is made out of iron? If so, you can absolutely recycle it. In some cases, iron fencing will actually be able to be reused by others. In other cases, it will have to be liquified, and reshaped to create other useful iron products. These days, cars contain mostly steel and aluminum components. However, in the past, cars contained a great deal of iron. This is due, in large part, to iron’s great durability. Iron engines could withstand tons of abuse and thrive for years upon years. 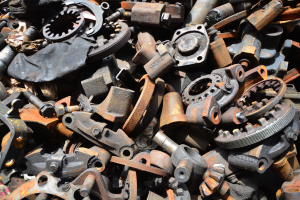 If you’ve ever owned any old automobiles, you could very well have iron car components laying around your house or garage. These components can be melted down, put in molds, and reshaped to serve other, more useful purposes. Iron piping can be used for a range of different purposes, accommodating everything from water systems, to gas systems, and more. If you’ve used iron piping in the past, you could very well have some laying around your house. If this is the case, you need to think about having it recycled. As is, your spare iron piping is serving no function. Why not make a little bit of money off of it by trading it in to be recycled? Do you have any of the iron items discussed above? Do you have any other iron items? Looking to recycle them? If you’re thinking about recycling iron in Chicago, we here at Central Metal Recycling are the people to see. We recycle iron items of all kinds, including, but not limited to every item which was reviewed on our list. Our team of recycling specialists looks forward to working with you.